No matter what it is they do, a Cohen brothers' film is always going to garner interest and attention. Like Neil Young, you might not like everything they produce, but you sure want to see what it is they've done this time round. From the sublime (No Country For Old Men) to the misjudged (The Ladykillers) to the audience-splitters (The Big Lebowski is either loved or hated), the Cohens never fail to garner a reaction. Inside Llewyn Davis, it seems, falls in the third camp. At least for the rest of the world. Sitting here now, writing this, I'm still not sure what I think about it - which is not a reaction I'm used to when watching something these two have produced. The story of a down-at-heel folk singer (played by Oscar Isaac), struggling to come to terms with the death of his band partner and his failing solo career is at times darkly funny, but overall feels shallow and insignificant. Which is probably the one thing I wasn't expecting to feel. A lot has been written about how unlikeable Davis is, but that's not something I had an issue with - there are clear reasons for his behaviour, and while he may be an unmitigated arse you can kind of cut him some slack. A lot has also been written about the cat - with some claiming it's symbolic of the life Davis is struggling to cope without and the career he is trying to make on his own. On the surface at least, it's a handy comic device which also serves to garner sympathy for a man who pisses everyone off as he moves from couch to couch. A sympathy the Cohens do away with two-thirds of the way through the film. It could, of course, just be a cat. But it's not the cat, or the story, that causes me problems with this film - both are great and work well. It's the other characters. Carey Mulligan (playing Jean, who has a complicated relationship with Davis) and Jon Goodman (playing a jazz musician) both do well with the little they're given - the characters are just not well drawn enough. Carey's angry character gives us no reason to like her, and her dialogue is staggeringly unconvincing, while Goodman's Roland Turner just seems to be an overblown cliche. Both of which chip away at your connection to the film. The one character who seems well-conceived is Davis himself, with everyone else merely window dressing. But I'm beginning to think this is a deliberate conceit rather than poor storytelling. One huge plus for this film, of course, is the music - with Please Mr Kennedy a particular highlight - and it's the use of the music, and the setting of all this in the blossoming New York folk scene of the early 60s, that makes me think the Cohens might be up to something. Like folk songs themselves, this film feels flimsy, almost overtly whimsical, with first impressions not always favourable. But like any good song - folk or otherwise - the more you think about it, or even re-visit it, the more you get out of it. 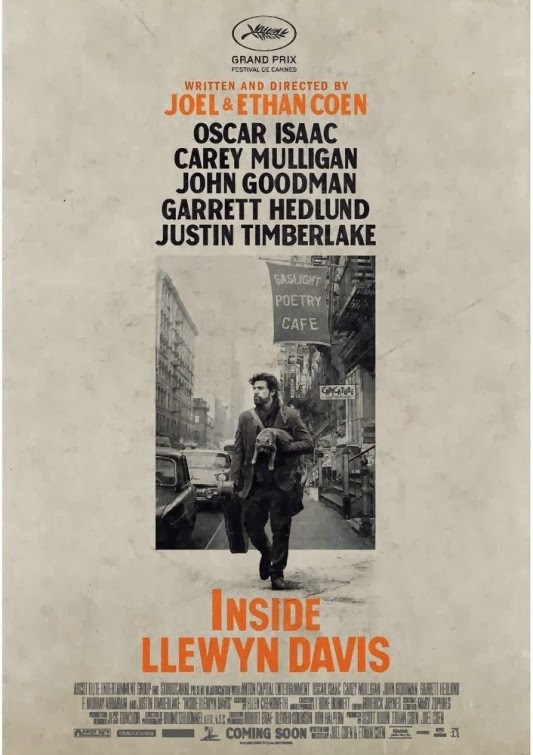 I started writing this review still unsure as to what I thought of Inside Llewyn Davis, yet as I've been hamming at the ol' keyboard more thoughts and views have come to mind. I think I like it a lot more than I first thought. I know I want to watch it again. And I like the cat. It's not a Cohen classic by any means, but I think there's more going on here than appears on the surface (again, much like a really good folk song). Of course, that could all be cobblers and the Cohens are just having a laugh at everyone else's expense. Let's not rule that out. But I'll be watching it again. Just to double check.